Late last year, it was revealed that Link would become a racer in Mario Kart 8. But that wasn’t his first Mario rodeo. Nor was it the first time Zelda crossed over into the Mario series—far from it. This post originally appeared 3/31/15. Since the late eighties, or more precisely, since the arrival of Zelda, it and the Mario games have traded characters, references and imagery dozens of times, from the earliest NES games to the latest iterations of the two series. Let’s have a look at some notable examples. The very first Mario reference in the Zelda series can be found in the very first game—Manhandla, the third boss of The Legend of Zelda, is described by the Japanese (and only the Japanese) manual as a four-limbed, massive Piranha Plant. A Mario reference pops up very early in the game, with portraits of Mario hanging on the walls of some of the houses in Kakariko village. 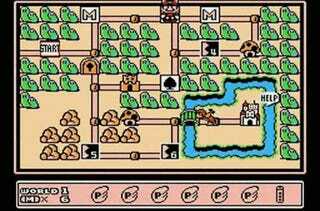 Furthermore, Chain Chomps appear as enemies in one of the dungeons, and there are also traps called Guruguru Bars strewn throughout the game which greatly resemble Mario’s Fire Bars. This game has oodles of Mario references. First of all, every Mario enemy in the above GIF can be found in Link’s Awakening, although with some changes—for example, unlike in A Link to the Past, Chain Chomps are friendly animals instead of enemies. Wart, the Big Bad from Super Mario Bros 2., also makes an appearance as Mamu, leader of the frog choir, the twist being that “Mamu” is Wart’s original Japanese name in SMB2. Two Mario-related items show up in the game’s Trading Sequence sidequest: the first is a Yoshi Doll, which can be obtained in the Trendy Game Shop, and the second is a photo of Princess Peach, included in Christine’s love letter to Mr. Write. There’s also a direct reference to Mario himself in the form of Tarin, a black-haired mustachioed man who wears red, likes to pick mushrooms, and gets transformed into a raccoon when he eats one of said mushrooms. Another NPC, the Cucco Keeper, looks a lot like Luigi. You can find two characters at the the Lon Lon Ranch, where you first meet Epona: Talon and Ingo, who look a lot like Mario and Luigi, respectively. You may also notice that Talon (along with his daughter, Malon) wear a brooch shaped like Bowser’s head. There are also portraits of several Mario characters, like Peach, Yoshi and Bowser, hidden behind a window in the Hyrule Castle courtyard. In Majora’s Mask, the Happy Mask Salesman has several masks on his backpack—one of them being, as you can see, a Mario mask. Also, there are Mario bros. lookalikes in this game as well: Mr. Barten, the owner of the Milk Bar, looks like Mario, while each of the three Gorman brothers resemble Luigi. There are less original references as we move forward, like Fyer’s Banzai Bill shirt above from Twilight Princess, but the Mario characters we’ve seen do appear in later games: Bob-ombs, for example, are present in Four Swords and The Minish Cap, Thwomps can be found in Four Swords Adventures and Oracle of Seasons, while Talon, the Mario-like ranch owner, goes on to appear in three games after his Ocarina of Time appearance. Chain Chomps have a tendency to show up everywhere, too, having popped in five Zelda games, including Hyrule Warriors, where one of them serve as a weapon. 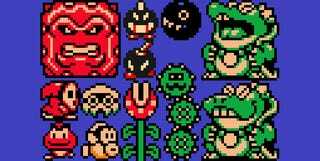 Mario owes its first Zelda reference to the Warp Whistle in Super Mario Bros. 3. It’s very similar to the Recorder in the first Legend of Zelda, in that it transports you to another area, summons the same cyclone, and even plays the same three-second tune. In Legend of the Seven Stars, a sleeping Link appears at the inn in Rose Town. Zelda’s “Secret” tune plays when you try to talk to him. Here’s a more obscure, hidden easter egg: in Sunshine, you have to race a masked character called Il Piantissimo. 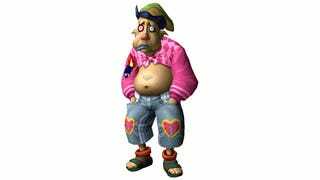 By hacking the game with Action Replay or Gameshark codes and removing the mask from his in-game model, you can discover that his face is identical to the Running Man’s from Ocarina of Time, or the Postman’s from Majora’s Mask. The boss of the first chapter in Super Paper Mario, Fracktail, being a robotic dragon, drops a few computer-related comments during your fight with him—one of them is “I AM ERROR,” which is a rare reference to The Adventure of Link. Later on, in Chapter 2-3, during your visit to Merlee’s Mansion, you find and inevitably break a vase balancing precariously on top of a question block. 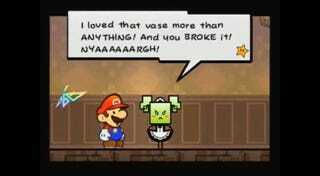 Mimi, the vase’s owner, is quick to tell you that the vase was worth 1,000,000 Rubees—the total worth of the vases you break in Zelda might be close to that number, but in Rupees, not Rubees. Speaking of Rupees, there’s a nice visual reference to them in the Rolling Gizmo Galaxy in Super Mario Galaxy, in the form of a batch of blue star bits arranged in the shape of a Rupee. 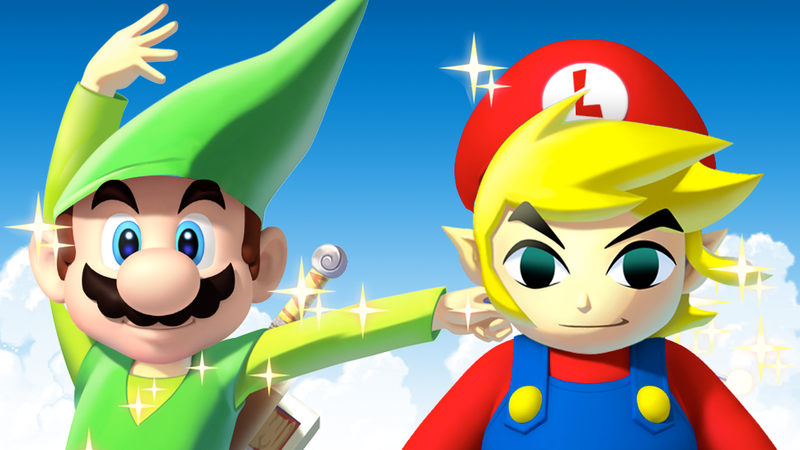 World 5-2 in Super Mario 3D Land is basically Zelda in Mario level form. It’s a temple-style stage, played in a top-down view, where you move from room to room, similar to a dungeon in the first Legend of Zelda—which makes sense, considering the level was made as a tribute to the game’s 25th birthday. Link makes an appearance in the Rainbow Run level—specifically, it’s a hidden room with a giant, blocky version of his original 8-bit sprite, made up of black floor tiles. Lighting them up reveals 8-bit Link in his full glory, plays the Zelda “Item Found” tune, grants you a green star, and lets you listen to a remix of the Zelda series theme. And we’ve come full circle. Apart from adding Link as a racer, the Legend of Zelda x Mario Kart 8 DLC adds Hyrule Circuit, a new track filled with Zelda references (like coins being turned into Rupees), and three kart parts: the Triforce Tires, the Hylian Kite glider, and the Master Cycle bike frame. The track returns in the Switch version of the game, Mario Kart 8 Deluxe. Do you remember any Mario-Zelda cross-references that aren’t on the list? Make sure to mention them in the comments below.